Sarcomatoid carcinoma (SaC) is a rare variant of squamous cell carcinoma with sarcomatoid features having biphasic characteristic malignant mesenchymal spindle cell and squamous cell component comprising of dysplasia, carcinoma in situ, or invasive carcinoma. 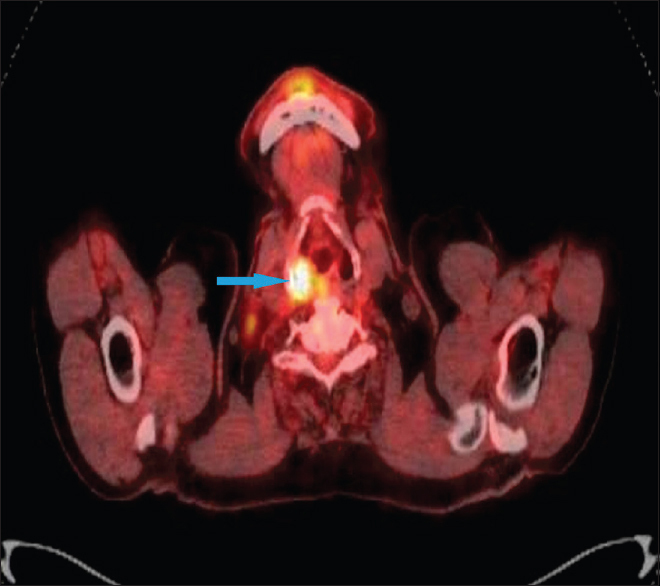 Most information about this malignant entity in the head-and-neck region has emerged from larynx and oral cavity with an incidence of 0.5%–3% and 1%, respectively, with very few cases reported in hypopharynx. We hereby report such a case in a 76-year-old male who presented with dysphagia and swelling right side neck. Clinicopathological evaluation showed a localized SaC hypopharynx. In view of old age and comorbidities of hypertension and diabetes, no surgical intervention was contemplated, and he was treated with definitive concurrent chemo-radiotherapy (CCRT). A thorough review of the literature revealed that while earlier reported cases underwent upfront surgery followed by adjuvant RT or adjuvant CCRT, we treated this case with combination of chemotherapy and RT resulting in a significant therapeutic effect. Sarcomatoid carcinoma (SaC) is a rare malignancy with unique biphasic histologic pattern reported in various organ systems apart from head-and-neck (HN) with larynx being the most common location with an incidence of 0.5%–3%, followed by oral cavity with 1%. HN SaC is associated with a dismal prognosis as compared to extra-oral sites with higher recurrence and mortality due to extensive lymphatic and distant dissemination. Surgery has been considered the standard of care for HN SaC but concurrent chemoradiotherapy (CCRT) as a definitive therapeutic modality may result in excellent clinical and radiological response, as seen in our case. 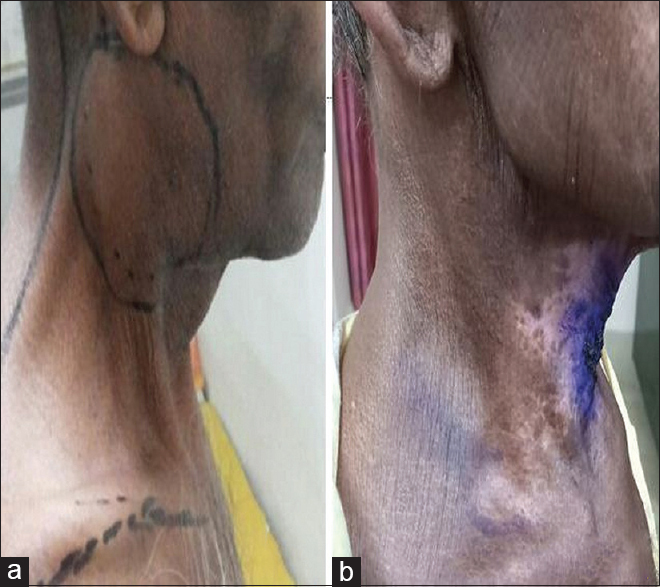 A 76-year-old male, chronic smoker, hypertensive and diabetic presented with dysphagia and swelling right side neck. Clinical examination showed conglomerate lymph node (LN) mass right neck cervical level II/III. Otorhinolaryngologic examination showed a 3.8 cm × 2.5 cm growth right pyriform sinus (PFS), biopsy from which revealed pleomorphic spindle cell tumor with large hyperchromatic nuclei, prominent nucleoli with frequent mitosis with a mitotic rate of 4 per high-power-field arranged in intersecting fascicles. Few strips of squamous mucosa showing full thickness dysplasia were also present [Figure 1]. 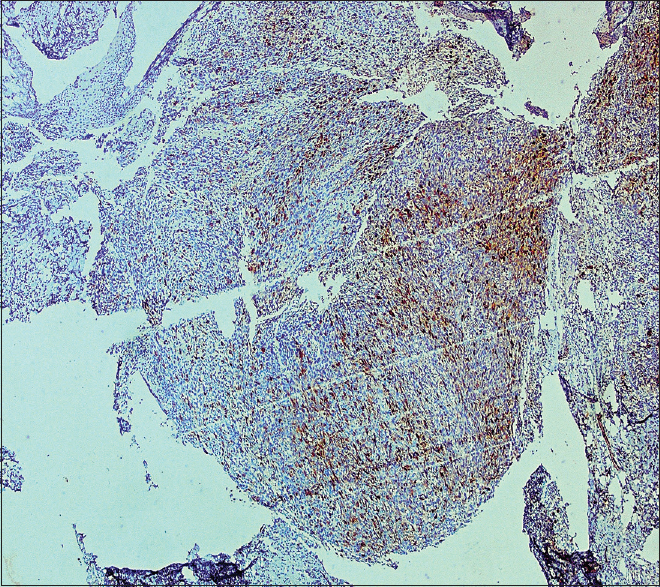 Immunohistochemistry (IHC)-stained positive for pan-cytokeratin (pan-CK) [Figure 2], p63 [Figure 3] and S-100 [Figure 4] while stained negative for smooth muscle actin (SMA) which gave a diagnosis of SaC of PFS. 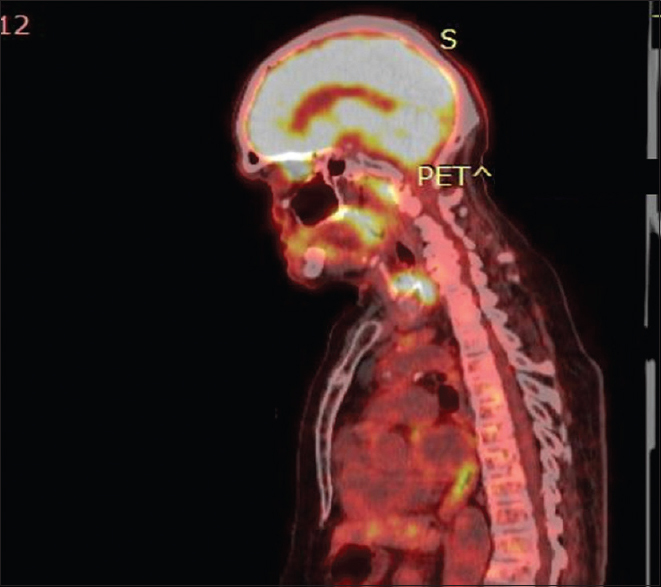 Whole body 18-fluorodeoxyglucose positron emission computed tomography (WB-18-FDG-PET/CT) scan showed a 2.4 cm × 1.1 cm × 1.1 cm growth right PFS [Figure 5] with a standard uptake value (SUV) of 10.36 and LNs 6.2 cm × 4.2 cm right level II and 3.5 cm × 2.6 cm right level III with SUV of 19.99 and 8.81, respectively [Figure 6]. Given old age, multiple comorbidities and N3 nodal status with fixity to underlying structures indicating an advanced stage, no active surgical intervention was contemplated. He was treated with external beam RT to a dose of 70 Gy in 35 fractions along with 5 cycles of 50 mg weekly cisplatin given on a concurrent basis at 40 mg/m2. Due to persistent nausea, vomiting, and leukopenia, the patient was not given the sixth chemotherapy cycle and also no further adjuvant chemotherapy was planned or given. He showed significant therapeutic benefit to treatment with improvement in dysphagia and complete resolution of the LN mass [Figure 7]. Clinical evaluation and WB-18-FDG-PET/CT 3 months post-CCRT showed complete resolution of the PFS growth along with cervical LNs [Figure 8]. At present, under follow-up and is disease free for more than 9 months. SaC is a rare form of squamous cell carcinoma (SqCC) consisting of an epithelial component with poorly differentiated squamous and a mesenchymal component with spindle cell proliferation,,,, with both components arising monoclonally from a single stem cell. The sarcomatoid component represents a dedifferentiation from the squamous cells and known by various names as spindle cell carcinoma, carcinosarcoma, or pseudosarcoma., Apart from HN, SaC has been reported in most commonly in lung followed by urinary bladder, upper aero-digestive tract, breast, gallbladder, small intestine, colon, ovary, and prostate. Larynx is the most common location in HN SaC,,,, with the most common sub-site being glottis followed by buccal mucosa in oral cavity., Hypopharynx as an epicenter for HN SaC has been very rarely reported and to name a few; Viswanathan et al. reporting six cases, Sharma et al., 4 cases in Indian literature while Chang et al., reported 8 cases the highest till date, Iqbal et al., 2 cases, Terada 1 case, Zheng et al., 2 and Hardisson et al., reported 1 case. HN SaC has been reported mainly in elderly males,, between 5th and 7th decades of life,, with risk-factors such as tobacco chewing in oral cavity,,, smoking and alcohol consumption in larynx,,,, and hypopharynx,,,,,,, and prior RT exposure., Early stage lesions have been mostly reported in Western literature as compared to advanced stages reported in developing countries due to late reporting of symptoms and lack of advanced diagnostic facilities. SaC oral cavity mostly presents as ulceroproliferative growth associated with trismus and pain,, laryngeal lesions with hoarseness of voice while hypopharyngeal lesions cause dysphagia, odynophagia, and foreign body sensation.,,,, Lymph node (LN) involvement is most common in oral SaC, while least common in hypopharyngeal lesions with an incidence of 0.5%, though our case presented with N3 LN. However, as compared to HN SqCC, SaC has been found to have a higher lymphatic involvement as it can spread more easily within tissue planes which further increases the risk of distant dissemination. Dissemination from hypopharynx has been to brain and skin while other HN sites spread to lung, liver, bone, soft tissue, skin and heart. SaC has a biphasic nature comprising of the sarcomatous spindle cells which are arranged in various patterns such as fascicles as seen in our case and also storiform pattern, and epithelial component.,, Tumor cells show prominent eosinophillic nucleus with high mitotic counts of 3–8/hpf with bizarre atypical mitosis. The epithelial component may be in the form dysplasia or carcinoma-in-situ or component of the infiltrating tumor. 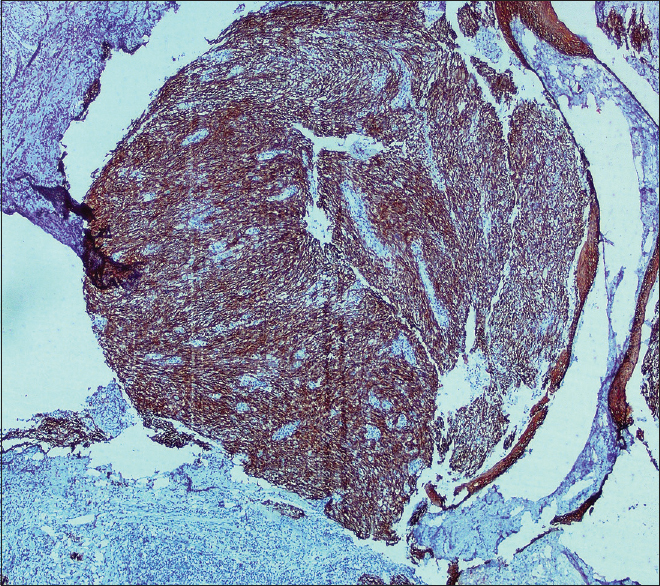 IHC differentiates a SaC from other malignant mesenchymal tumors such as leiomyosarcoma, myoepithelial carcinoma, mucosal spindle cell melanoma, and osteosarcoma. IHC strongly positive for epithelial markers such as pan-CK and p63 and weekly positive for S-100 confirms the diagnosis of SaC while negativity for SMA, desmin, vimentin, calporin, epithelial membrane antigen (EMA) rules out other pathologis., Due to rarity, the debate regarding its optimal management continues. Few authors have used upfront surgery (near total hypopharyngectomy) followed by adjuvant CCRT or only RT, while we exhibited upfront CCRT. Attempts to understand the development, progression, and management of this tumor have been non-beneficial due to the lack of large clinical trials. Identification of unique chromosomal abnormalities, biologic pathways are necessary for the sequencing of events associated with its evolution and the development of novel biological targets for therapy. SaC should always be considered in patients presenting with a PFS lesion so as to enable a prompt initiation of appropriate treatment. We also emphasize the role of CCRT in all cases of PFS lesions with a significant clinical benefit without the morbidity of extensive surgery. We would like to thank the patient for allowing us to publish the case report and use the images taken during her stay in hospital. Chang NJ, Kao DS, Lee LY, Chang JW, Hou MM, Lam WL, et al. 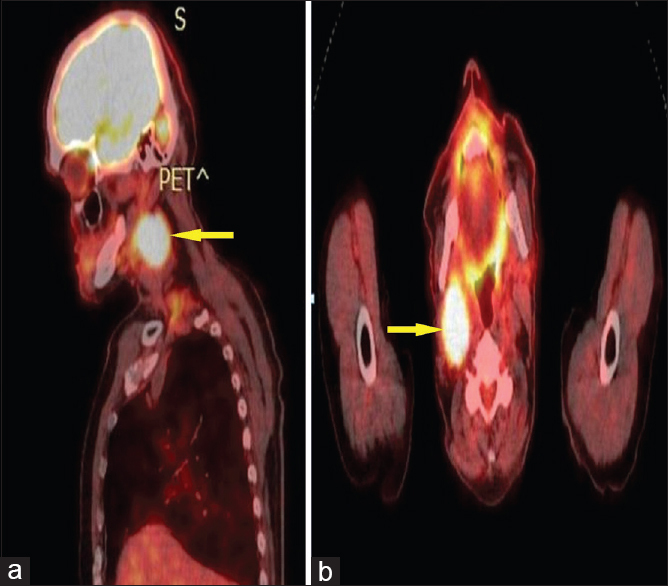 Sarcomatoid carcinoma in head and neck: A review of 30 years of experience – Clinical outcomes and reconstructive results. Ann Plast Surg 2013;71 Suppl 1:S1-7. Thompson LD, Wieneke JA, Miettinen M, Heffner DK. Spindle cell (sarcomatoid) carcinomas of the larynx: A clinicopathologic study of 187 cases. Am J Surg Pathol 2002;26:153-70. Dubal PM, Marchiano E, Kam D, Dutta R, Kalyoussef E, Baredes S, et al. Laryngeal spindle cell carcinoma: A population-based analysis of incidence and survival. Laryngoscope 2015;125:2709-14. Iqbal MS, Paleri V, Brown J, Greystoke A, Dobrowsky W, Kelly C, et al. Spindle cell carcinoma of the head and neck region: Treatment and outcomes of 15 patients. Ecancermedicalscience 2015;9:594. Viswanathan S, Rahman K, Pallavi S, Sachin J, Patil A, Chaturvedi P, et al. Sarcomatoid (spindle cell) carcinoma of the head and neck mucosal region: A clinicopathologic review of 103 cases from a tertiary referral cancer centre. Head Neck Pathol 2010;4:265-75. Mahajan A, Mohanty S, Ghosh S, Urs AB, Khurana N, Gupta S, et al. Sarcomatoid carcinoma of the oral cavity: A diagnostic dilemma. Case Rep Dent 2017;2017:7495695. Sharma A, Das R, Sharma JD, Kataki AC. 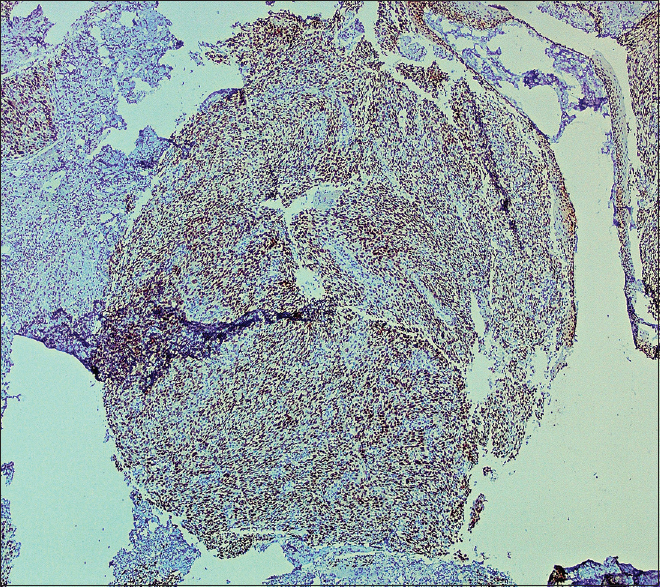 Spindle cell carcinoma of the head and neck: A clinicopathological and immunohistochemical study of 40 cases. J Cancer Ther 2012;3:1055-9. Terada T. Sarcomatoid squamous cell carcinoma of pharynx: A case report with immunohistochemical study. Case Rep Clin Pathol 2016;3:39-42. Zheng Y, Xiao M, Tang J. Clinicopathological and immunohistochemical analysis of spindle cell carcinoma of the larynx or hypopharynx: A report of three cases. Oncol Lett 2014;8:748-52. Hardisson D, De Diego JI, Prim MP. 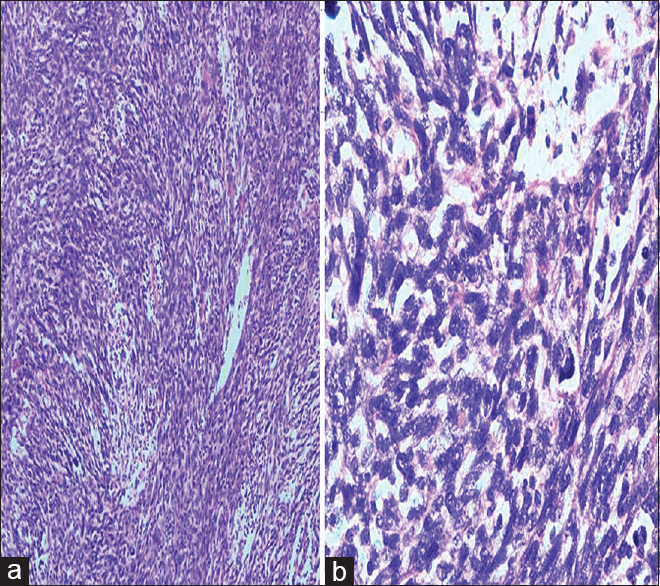 Sarcomatoid carcinoma of the pyriform sinus with brain and subcutaneous metastases: An unusual metastatic spread pattern. Eur Arch Otorhinolaryngol 2000;257:445-8.